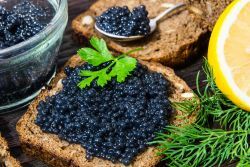 Dining in Russia can be an opulent experience, as caviar and vodka are always en vogue, and restaurants have certainly stepped up their game after the typically bland repertoire of Soviet-era dining options. Big cities such as Moscow and St. Petersburg now offer a more diverse array of cuisine, but certain staples of Russian cooking remain prevalent throughout the country. 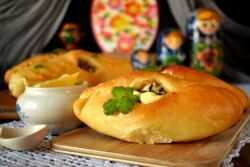 These include beef Stroganoff and chicken Kiev, both native to Russia, as well as pirozhki, small pies usually filled with ground meat and cabbage, and pierogi, large pies eaten as dessert. Bliny are akin to crepes, thin pancakes rolled up with sweet or savory fillings. Olady are tiny, round pancakes that serve as a vehicle for the ubiquitous caviar, which also make an appearance in zakuski, appetizers consisting of caviar, smoked sausage, pickles, cheese and sour cream. Russian rye bread often accompanies a meal, flavorful enough to be eaten without butter. 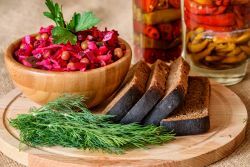 The main meal of the day for Russians has traditionally been lunch, and is structured around an appetizer, soup, main course of meat or fish, and dessert. Dill is commonly used as a garnish in fish courses, but it is also widespread amongst many different dishes. 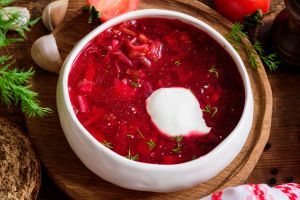 One of the most famous traditional Russian foods, and the one visitors have most likely heard of, is borscht – a hearty beet soup full of vegetables and meat, often finished off with a bit of sour cream. Shashlyk are Russian kebabs, and pelmeni is a dumpling made with minced meat filling, wrapped in thin dough and boiled until they float. Tea (chai) is another important part of the Russian dining experience, typically served from a samovar. Coffee (kofye) usually resembles thick Turkish coffee, although espresso and cappuccino are also available. Vodka has a long and storied history in Russian society, as evidenced by the fact that the creator of the Periodic Table of Elements, Russian chemist Mendeleyev, was also instrumental in establishing vodka standards used to this day. The name of the spirit is actually a diminutive form of the Russian word for water, “voda.” Initially intended for medicinal purposes, vodka became so popular that Russian leaders from Ivan the Terrible to Czar Nicholas II tried unsuccessfully to ban the drink. The regulations for vodka today are strictly controlled, as affluent Russians demand purer and more innovative variations on the national drink. The most popular way to enjoy vodka in Russia is to drink it chilled and straight, as a shot chased with something to eat, commonly pickles or herring. The sophisticated vodka drinker knows how to pace themselves rather than over-imbibe, but the threat of the Russian hangover cure should be enough to dissuade anyone from indulging too far: a potful of cabbage brine.